It had to happen. This dress had to be worn with my red sweater. And what’s extra awesome is that when I walked into work today I saw that my boss was wearing a red blazer and leopard scarf! If you work in an office, have you noticed that people get on the same wavelength with their clothing choices? So weird. I also had to include the disturbing photo below. Taking photos in the hall makes me want to put my arms up on the walls. That top is incredible, I love the colour & the sleeve detail, it looks great with the leopard too. I went to a work conference yesterday and the 2 top bosses were wearing the exact same dress in the same colour, size and everything! 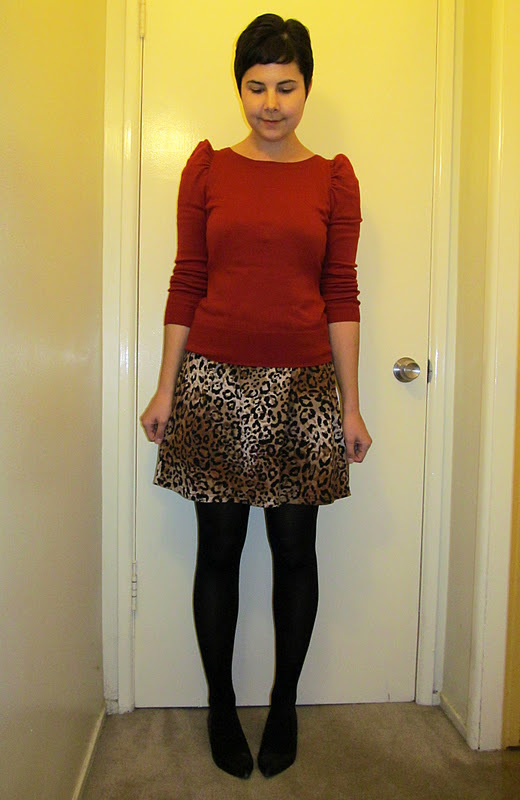 Further proof that red and leopard were made for each other. LOVE the pointy-tip shoes and the sleeves on your top! Really darling details that add a lot of character. Ha! That last photo is super amazing (and also creepy). What is it about animal prints that makes them go so well with red? I don't have any animal print in my closet but it is still one of my favorite combos on other people. three cheers for puffy shoulder sleeves :) Cute outfit and that last photo is the most awesome thing I've seen all day. Haha I love the second picture! That red sweater is perfect layered over your leopard dress. 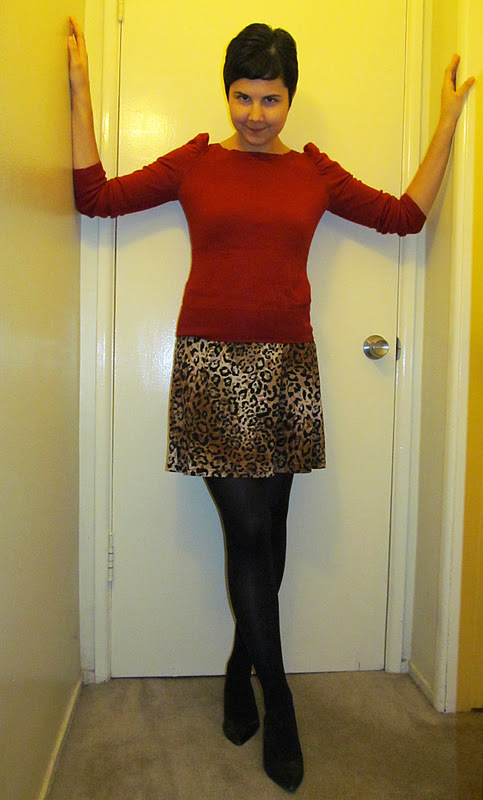 Leopard and red are just meant to be together. 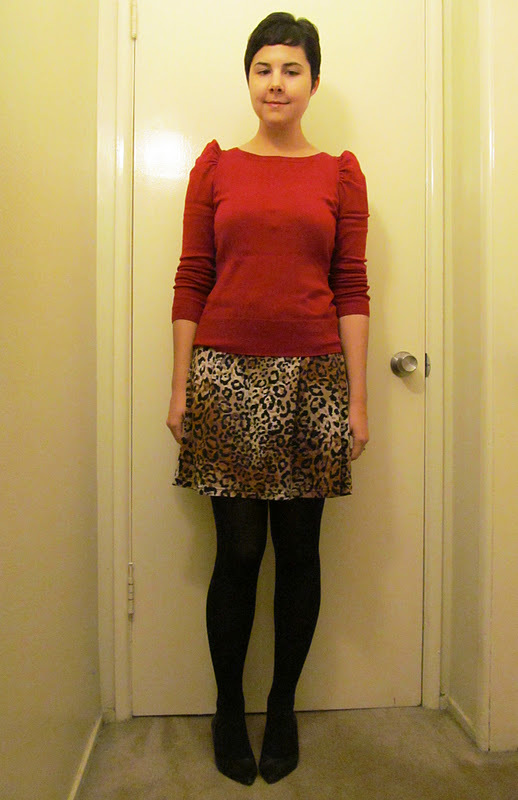 I'm digging this sweater, especially paired with leopard! p.s. that last photo is so cute! ha! whoa amazing thrift find w/ the leopard print dress. So funny about your work, ppl def do that at mine as well but usually more like black and grey haha. Super cute!